16 pp. Roman, 1344 pp. 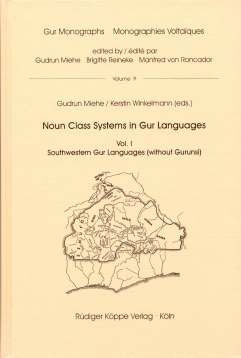 These books are part of a two-volume publication on noun class systems in Gur languages. The first volume contains descriptions of the southwestern Gur languages. As far as their classificatory status is concerned, these are the South Central Gur languages without Gurunsi and most of the other languages classified as probable or improbable Gur by Anthony Naden (1989). In order to facilitate comparison of the data, all contributions follow the same order. Each article starts with some geographic and demographic information, and remarks on the state of linguistic research on the language. The contributors agreed on a minimal word list which appeared as constitutive or as indicative for certain noun classes and their possible evolution. The articles in each classificatory group are followed by summary Comparative Notes. The bibliography at the end of the volume contains all the titles mentioned in the contribution. 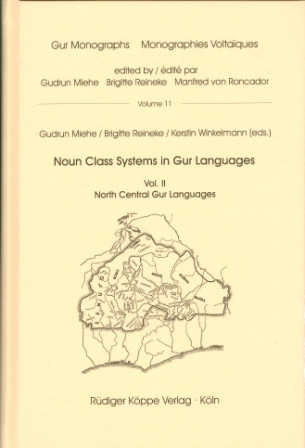 This book is the second volume of a three-volume publication on noun class systems in Gur lan­guages, noun classes being one of the most characteristic features of Niger-Congo languages. The first volume appeared in 2007 and described the southwestern Gur languages (without Gurunsi). The present second volume of is devoted to languages of the North Central Gur group. It includes descriptions of Bwamu and Koromfe, and of most Oti-Volta languages of all sub-groups, i.e. Buli-Konni, Oti-Volta West, Oti-Volta East or Atakora, Gurma and Yom-Nawdm. Articles on the noun class system of Pana and Samoma, two Gurunsi languages, and of Syer, a Senufo language, are also appended. A first version of the Syer noun class system was published in the first volume under the language name Tenyer, which is a variety of Syer. Depending on the research situation in each case, existing knowledge, and other factors, the art­icles give more or less comprehensive descriptions of the noun class systems of the languages under consideration. While most of them go into details, some present only the most characteris­tic features of the noun classes of the language concerned. However, all contribute significantly to the general survey of the noun class systems of Gur and may serve as sources for further historical comparative work. As was the case in the first volume, the descriptions are essentially based on data collected by the authors during periods of field research. In some cases, Gur language data published by other authors has been presented and reconsidered, especially from the comparative point of view. The structure of the articles corresponds to that found in the first volume. This procedure guaran­tees the comparability of the data. In the “Historical remarks” given at the end of each article de­scribing the noun class system of a particular language, and in the “Comparative notes” included after each classificatory group, the historical and comparative point of view assumes a central position. Both volumes are separately available (see links below).